When I originally published the first novel in The Conjurors Series in 2011, I had no concept of self publishing. It never occurred to me to promote my book. I simply used Amazon as an easy way for friends and relatives to download my book so I didn’t have to buy them a hard copy and mail it. Two years later, self publishing had become a phenomenon, and my brother suggested that I market my novel and see what happened. But with a cover cobbled together using Microsoft clip art and no outside editing expertise, I wondered if my book was ready for public consumption. I’m very glad that I did some research and realized that for a self published author to be successful, she needs to have a polished product. A great story is at the core of any good book, but it’s hard to see through typos, horrific formatting, and a generic title that doesn’t provide any clues as to the content inside. Below are some tips I would recommend any writer take before releasing a first novel or re-releasing an existing story. Invest in professional cover art. Unless you’re a graphic designer (or are close friends with one) this is a monetary investment that will pay off. It’s the first glimpse readers have of the quality of your work, and it needs to shine. I used Streetlight Graphics, and was thrilled with the quality of their work. Hire a professional editor to review your writing. I thought I had all of the expertise required to edit my own book – I was a double major in journalism and English in college, and part of my day job involves editing others’ writing. But I was astonished at how many nits my editor found in my writing. She also provided a much-needed sanity check to ensure that there weren’t any inconsistencies in the story. I worked with Shelley Holloway, and found her eye for detail was exactly what I needed. Evaluate the title of your book. I recommend searching Amazon books and using a search engine to see what pops up when you enter your title. I found that there were at least a dozen books with the title I had chosen, which would make it difficult for someone to search for. Write a blurb that’s as interesting as your novel. I was glad that I spent some time writing and having my editor review my book’s blurb as well. After your cover and title, it will make the biggest impact on whether or not readers choose to buy your book. For tips from successful authors who have done this well, check out this post. Create a web presence for yourself as an author. At the very least, have a Twitter and Facebook account that can keep fans, friends and family updated on everything you publish. This is also a valuable place to direct fans as your book attracts attention so they can hear about future works that you publish. I also recommend having a website with information about yourself and your books. A blog is great as well if you have the time. It’s an excellent way to network with other writers and communicate with your fan base. Consider releasing both an e-book and a physical copy of your book. Despite a slight learning curve when it comes to formatting for an e-book, there is no downside to making your book available in digital form. It’s free and is a great way for you to have giveaways without breaking the bank. At the same time, there is something powerful about a copy of your book that you can hold in your hands and bring to local libraries and stores to see if they are willing to display it. So I’m proud to announce that I am re-releasing the first book in The Conjurors Series. It has a new title, The Society of Imaginary Friends (formerly Into the Dark), has been properly edited by an outside professional, and is rewritten with some of the knowledge I’ve gained in the years since I originally wrote it. But choosing to embrace her potential will set Valerie on a treacherous course–one filled with true love, adventure and perilous danger. The second novel in the series, Knights of Light, will be released in early March. I’d love to hear what you think about my story, and I welcome any reviews! 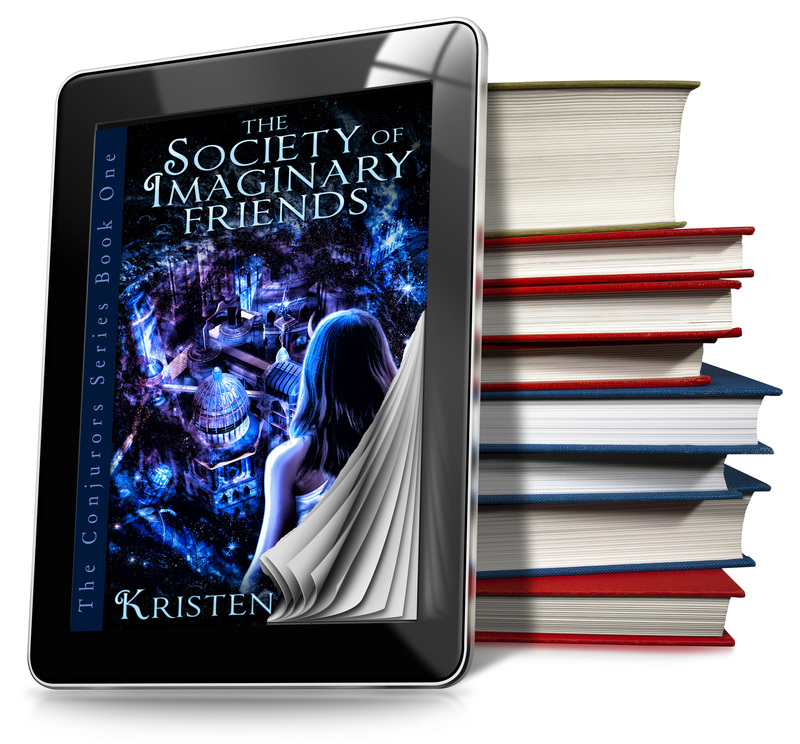 This entry was posted in Self Publishing, The Conjurors and tagged Kristen Pham, re-releasing your novel, self-publishing, The conjurors, The Conjurors Series, The Society of Imaginary Friends, writing by conjurors. Bookmark the permalink. Can’t wait! How do I get it? I love the cover for this and shall now check out the link you provided. Thanks for the interesting post. Kristen Pham’s blog in general is really insightful on self-publishing, but this is a great article on the essential steps of getting out your first article! Thank you Lauren! And thank you for your reblog. I checked out your site and was enjoying hearing about your own writing plans. Definitely will be checking your site out again in the future.